Ronald Walter Kolisz, age 79, of Valdosta, died Saturday, January 19, 2019, at Langdale Hospice House surrounded by family. The family will receive friends at St. John Catholic Church in Valdosta, GA. Friday, January 25, 2019 at 12 pm. There will be a vigil service at 12:30 pm. then a Funeral Mass will be held at 1:00 PM. Mr. Kolisz was born February 25, 1939, to the late Walter Kolisz and Charlotte Frankowski. Ronald was a devoted husband, father, and grandfather. 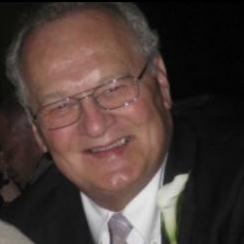 He loved books, crosswords, was an avid Chicago sports fan. He loved to make people laugh, especially at himself! Survivors include his sons, Paul Kolisz, Eric (Katie) Kolisz, daughters Jennifer (Jason) Bailey, Amy Slaven, and daughter in law Karin Kolisz. He is also survived by many grandchildren and great grandchildren. In addition to his parents, Ronald was preceded in death by is loving wife, Eileen Kolisz, his sons Nick Kolisz, Greg Kolisz, daughter Tamara Hall, and granddaughter Amber Dykes. Reflection Cremation and Funeral Service of Tifton is in charge of arrangements.